Michelin starred chef René Redzepi’s world-famous Copenhagen restaurant, Noma, has been reimagined as a series of farm-style buildings within one whole restaurant. Bjarke Ingels Group (BIG) were tasked with redesigning the restaurant in line with Redzepi’s brief for a cluster of small, agriculturally themed buildings and created a 14,000sq ft (1300sq m) gastronomical village comprising 11 pavilions. Of those 11, one is a working greenhouse, while two other glass-encased buildings comprise a bakery and a test kitchen. The other eight are effectively the main restaurant areas and are connected by glass-covered walkways. The original Noma, which opened in 2003 and closed in 2017, was based in a waterfront warehouse in Copenhagen. 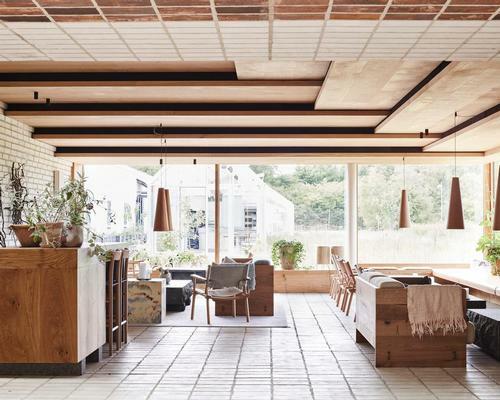 The new site for Redzepi’s restaurant is similarly set against water – by a lake in the city’s Christiania district – and houses one main and one private dining area, both of which are finished in oak. Ingels commissioned Studio David Thulstrup for the interiors after becoming a fan of their work on Instagram. Studio principal David Thulstrup wanted to create a bright space and so included touches such as brickwork that is lighter than that on BIG’s facades. Landscape architects Thing og Brandt Landskab led consultation in that area, while Sif-Gruppa consulted on acoustics and NT Consulting was the project manager.